Chef John Says: Everyone knows that the best part of Thanksgiving is the stuffing. I usually dedicate about 3/4 of my plate to it. My family always has a traditional stuffing/dressing but this past Sunday we had a pre-Thanksgiving feast at our friend’s house in New Orleans and it was decided that we should make a more NOLA-style dressing. 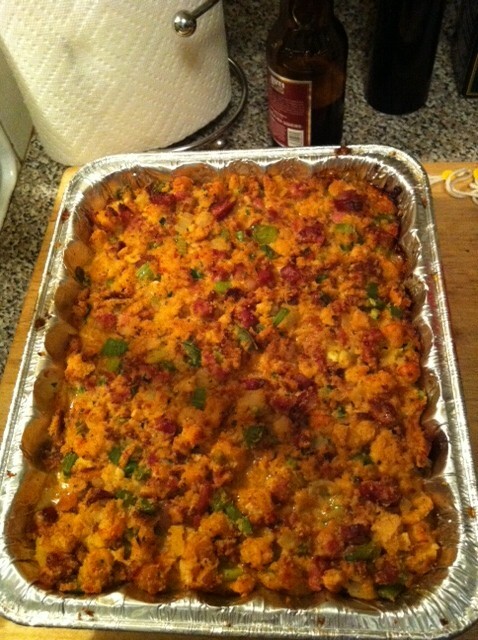 Tanya came across this beauty: Besh’s Crawfish Corn Bread Dressing. Like ALL of Besh’s recipes, this is very easy and delicious. Put the bacon fat, andouille, and pork sausage into a large skillet and cook over medium-high heat, breaking up the pork with the back of a wooden spoon. When the pork sausage meat has browned, add the onions, celery, bell peppers, and garlic and cook, stirring occasionally, until the onions are translucent, about 5 minutes. Add the crawfish and cook for 2 minutes. Transfer the mixture to a large mixing bowl. Add the remaining ingredients to the bowl with the sausage and crawfish and stir together until well combined. Spoon the dressing into a large heatproof dish. At this point, the dressing may be covered and refrigerated (for up to 1 day) until you are ready to bake it. Bake the dressing in a preheated 350° oven until it is piping hot and golden brown, 15–30 minutes.